Jellyfish paperweights glow in the dark and are 6 inches tall. 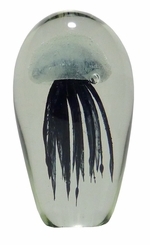 Hand blown glow in the dark glass jellyfish paperweights are truly magnificent from any angle. The jellyfish really does seem to float in the air! The tiny individual bubbles at the base of the tentacles seem ready to rise to the surface and you can imagine this jellyfish gliding in the currents of the ocean! 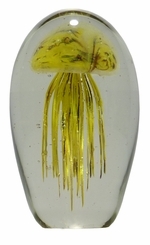 Standing 6 inches high by 4 inches in diameter and weighing 3.5 pounds, this is one amazing hand blown creature. Each of these are individually blown and so each is unique onto itself. The clarity of the glass is outstanding. 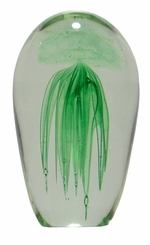 A stunning and treasured addition to any glass collection. Glow in the dark Jellyfish are hand made so sizes and colors may vary.